In 1979 I never would have imagined Rick Nielsen calling my house. With "I Want You to Want Me" saturating FM radio, I was attempting to master a Sears' Les Paul copy electric guitar, having already blown up the tiny 5-watt amp that came with it. Along with the useless sheet music, I struggled to learn Cheap Trick songs on an improvised amp made from an old record player. Fast forward to 1997. Yes, that is Rick Nielsen on the phone, I'm actually talking to one of my guitar heroes! I just had to tell him that "Baby Loves to Rock" was the first Cheap Trick guitar solo I figured out. Rick goes into technical guitarist mode explaining, "it's a tricky one to learn because I used a string bender, so you really can't do it unless you're pretty dexterous. So, did you do good?" "Yeah", I responded, "considering I had no string bender, just a cheap electric guitar." But, I digress, this isn't Guitar Player magazine. I wanted to get the dirt of Cheap Trick's break with their record label, Epic and their manager. "We we're headed in the wrong direction." Why the decline in popularity in the 80's and the lack of record promotion? "It was irritating, a strange time for us." Why did they only record with John Lennon for one day during his last Double Fantasy sessions? Rick avoided all the gossipy questions, concentrating on the new album and the newly energized Cheap Trick. Cheap Trick was formed in 1974 in Rockford, Illinois out of the remnants of the 60's band, the Fuse. 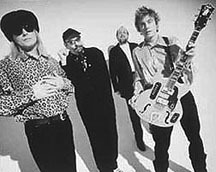 The Fuse, which included Rick Nielsen on guitar and Tom Petersson on bass, released one album for Epic in 1969. Adding Bun E. Carlos on drums and Robin Zander on vocals, Cheap Trick toured endlessly, delivering their own style of metalized-beatlemania. And they really haven't stopped touring, with Nielsen deadpanning, "no, never have & " After the phenomenal success of the album, "Live at Budokan", Cheap Trick hit the arena circuit for several years. But at the pinnacle of the band's success in 1980, Tom Peterssen left the group. The band seemed to suffer from the lack of band chemistry, trying out various record producers (at one time using Beatles producer George Martin). Epic didn't promote the band's albums and most of Trick's releases of the 80's seemed to fizzle. In 1988 Tom Petersson returned and the band released, "Lap of Luxury". Epic simply didn't believe in the band's songwriting abilities and brought in outside writers, coercing the band to release the power ballad, "The Flame". Although the song was successful, it became Cheap Trick's albatross. Finally, the animosity came to a head, and Cheap Trick decided on a change. Nielsen explained, "it was a falling out with the A&R people and a falling out with our manager. We were still good & we ended up going away from the Epic of yesteryear." Cheap Trick seems to have gone full circle in the 20 years since their vinyl debut in 1977, simply titled, "Cheap Trick". Their 1997 offering is also self-titled, an indie release on Red-Ant records bringing back the rawer, power pop sounds of pre-Budokan-stadium Trick. After being with Epic records for 13 original albums and with Warner Brothers for one, the band went back to basics, producing the new album themselves. I asked Rick if they had a record deal with Red-Ant when they started recording? "Nope, we did not. That came later. We started to make the record on our own." Was using the Cheap Trick title for the record an intentional coincidence with their first record? Rick explained that it was "kind of a coincidence, but that record [first album] was so long ago. It's not like we named Dream Police Twice! We had some other ideas, but they weren't very good." The live arena is one are in which few bands can match Cheap Trick's stamina. I mention that I've seen the band in both the large arenas and small clubs, but I preferred the club environment. Nielsen agrees, "I think I do & prefer that setting. But it's awful fun to play in front of big crowds, too. The adrenaline kicks in whether its 200 people or 20,000." Sarcastically adding, "I think that the adrenaline that gets most excited on the big shows is the manager and the promoter! The guys that are making the money." Do you think that pop sensibilities are making a comeback in rock music, with new bands such as Oasis? "Well, if they're not, they should be. I just think the idea of melody and harmony are a good thing. Cheap Trick - we're a pop band, but we have overtones of all kinds of different things." Cheap Trick has had a lasting influence of new generation bands as well, with Rick playing on one of Material Issue's albums. "Yeah, I played about three songs on that. I played live with the Smashing Pumpkins." I wondered, is it hard for the 1997 Cheap Trick to be relevant when its 70's contemporaries (dinosaur bands such as Styx, Foreigner, Journey and Boston) are milking the reunion bandwagon? "When you think about it, all those bands that you've mentioned, we've played with. Most bands won't say, 'Gee my favorite band is Boston, or gee, I want to be like Styx when I grow up. Not that they all want to be like Cheap Trick." Rick offers his view of why Cheap Trick is still relevant, still churning out effortless pop gems. "We're a band's band. We tour, we play. We don't wait for a record to tour. That's all we do, we play and make records. Fans like us and bands like us." But, he adds, "we're still noisy enough where you can't play our stuff for your mother and have her like everything." Finally, Nielsen summed up Cheap Tricks longevity, "we just try to make good records. We do an audition every single night we go out. You know it is an audition, if you play good, maybe somebody will go out and buy your records. If you don't play good, they probably won't come back and see you again. We try to play good. Want to pass that audition!"